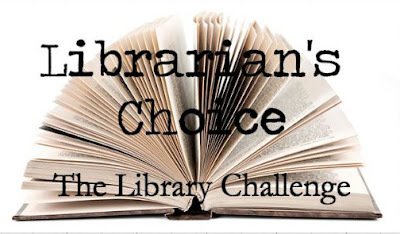 Welcome to the 'In The Pink' Impression-Obsession challenge! I have a card to share today. I kept my card really CAS, which is very difficult for me. But, I like the look, sometimes, and particularly for this cross image, I wanted it to take center stage. 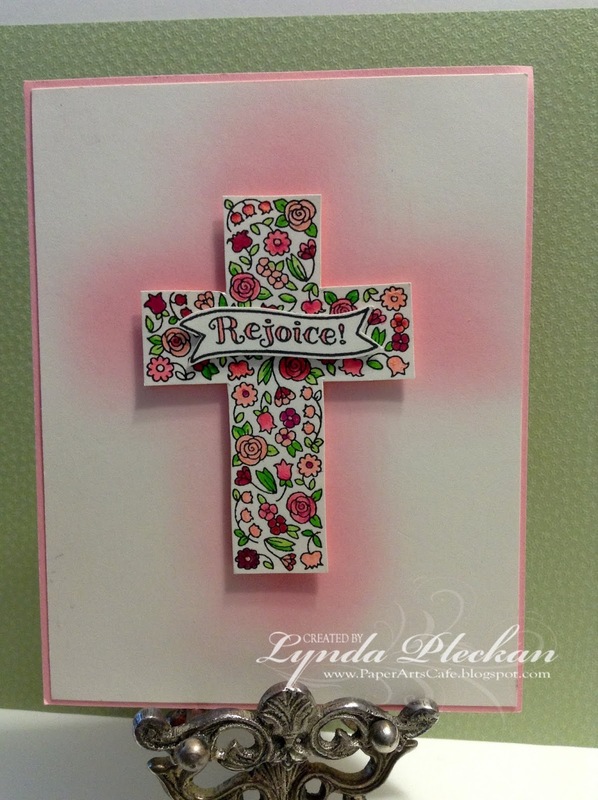 I felt anything I did with embellishing or other stamping would distract from it. I started with a cream card stock panel, and used my blending brush to apply some worn lipstick distress ink in a loose cross shape. I attached this panel to a pink A2 card front. Arteza Fineliner Pens. I just love these pens. They have very fine tips, and the colors are fabulously brilliant. 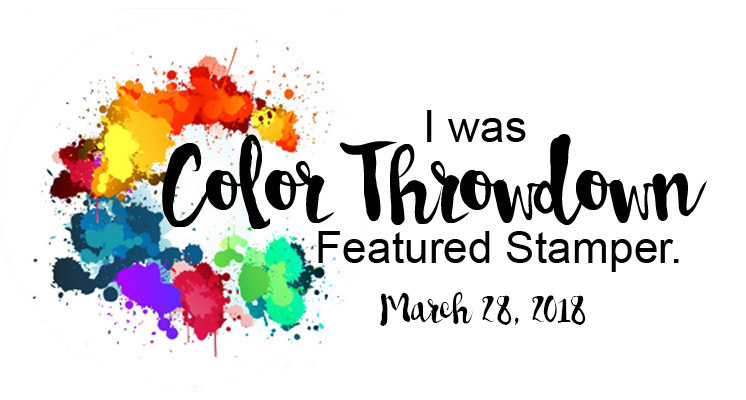 You can check them out at Arteza HERE to see the colors and sets available. 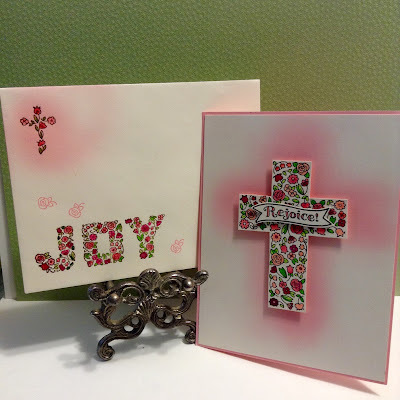 I attached the cross to the card front with foam tape on the pink brushed area, then stamped, colored and added the Rejoice banner with foam tape. 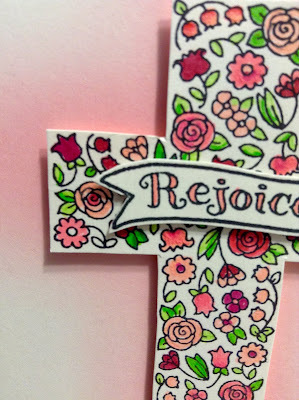 For the inside, on cream card stock, I brushed some of the pink, stamped the small cross from the set, and the row of flowers in pink. 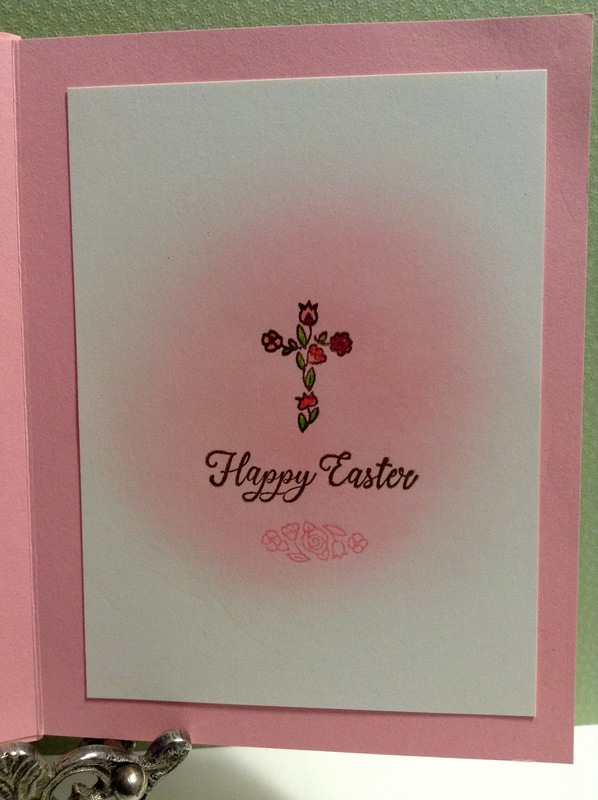 I stamped the Happy Easter and colored the cross flowers, and added it inside the card. 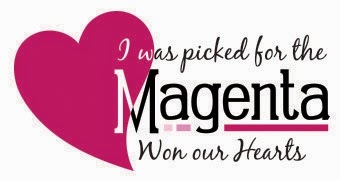 I hope you are inspired to join our In The Pink Challenge. You just might be lucky and win the $25 gift certificate to shop at the Impression-Obsession store. You can see more inspiration for this challenge from the other designers' blogs on the IO blog HERE. NOTE: The Arteza 72 count Fineliner pen set is on sale right now for $22.99 with free shipping! That's 70% off!! Thanks so much for visiting. I appreciate your comments. Beautiful card! I love the sponging and the little flowers are the perfect shades of pink. Thanks for joining us at Sunday Stamps, hope to see you again soon! A beautiful Easter card, love that you kept it CAS in design, thank you for joining in at MMM. 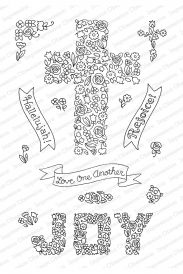 Wow, super lovely - a gorgeous cross! You've colored it in beautifully! Love that delicate background, too. Thanks so much for playing at Sunday Stamps! Pretty stamps and I love that you've decorated the inside too. Thanks for playing at AAA Cards. Really lovely creation 💕! Thank you for playing along with us at Allsorts this week. 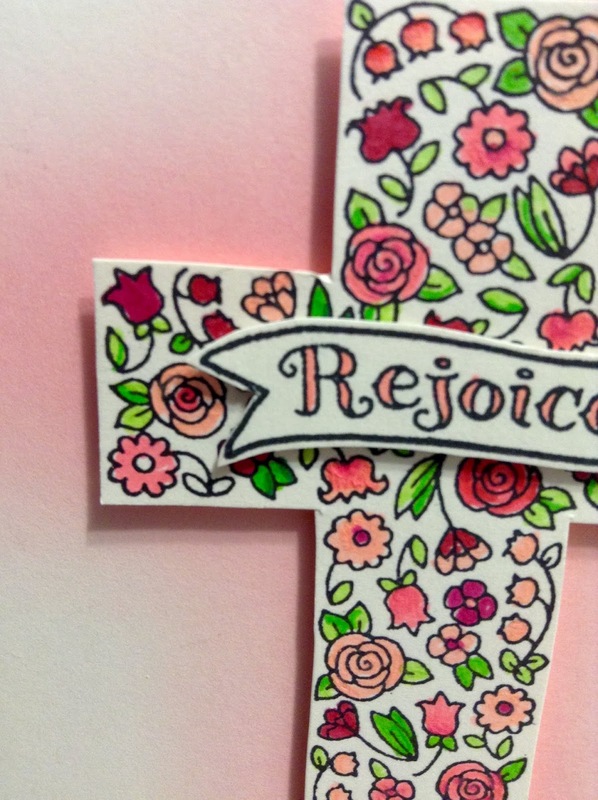 Beautiful cross card! Your design and color choices create a lot of impact. 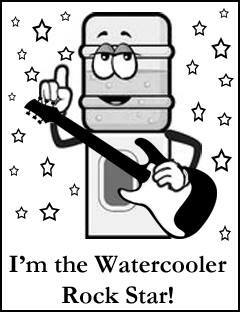 Thanks for joining us at Watercooler Wednesday. 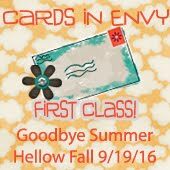 What pretty cards! Love your design in red and pink. 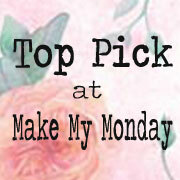 Thanks for playing along with us at Make My Monday. 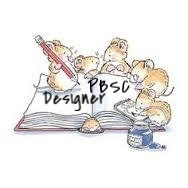 Looking forward to seeing your creative projects in the future galleries again. Such a lovely card and pretty colours. 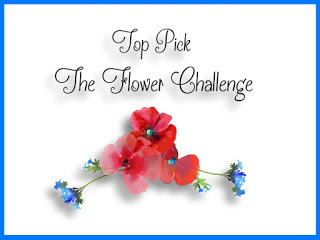 Thanks for sharing this with us at The Flower Challenge.